What progress has been made at Wyeside! 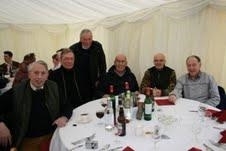 Marquee,roast beef,wine,beer tent,comedy speech,good rugby and excellent company! What more could an old boy wish for? Karl Barras looked in very good form, back to work after a premature retirement is clearly very good for him.Wearing his HCS 1st XV colours scarf outside the beer tent was a very sensible way to be identified by those who had not seen him for 50 years. His principal recollection of his days at HCS seemed to be his record consumption of 63 prunes in 9 minutes leaving him "off games" for the next 3 days! Lieutenant Colonel,Barrister at law, Charles Swabey was as distinguished as ever, though his OH tie looked a little worn.He has clearly enjoyed his enigmatic career in war and law. Jack Beech again manifest his encyclopaedic knowledge of all things Herefordian. His recollection of Jimmy Rowlands backing Torrington, ridden by IR Brown OH to win at 50/1 at Hereford races was fascinating. Our poor relations and outstanding half backs,Andrew Singer and Angus Craig,outflanked the security guards with their usual enthusiasm to sneak into the marquee to cadge apple pie and custard. Nothing changes! Reg White and JPG were sadly missed but were,in their absence,the subject of some fascinating gossip - I do hope that they miss out on the next reunion by which time we will all have had time to research our vague recollections for further revalations..
HCS sadly lost to Kings Worcester (averaging 6' 2ins and 14 stones) in the Quarter Final. KW (having beaten Millfield in the semi's) went on to win the final 52 - 0 against RGS Worcester. I thought HCS put up a very creditable performance in a very well managed tournament. Ah well,that's it for the next 50 years. Right to left: Charles Swabey ( No 8 ), Karl Barras ( second row ), Andrew Singer ( scrum half ), Tommy Taylor ( prop ), Jack Beech ( centre ) and Angus Craig ( fly half ).